Officer Swisher serves as the School Resource Officer. In August 2017, the Shelby Board of Education approved a contract, in conjunction with the City of Shelby, to hire an SRO. Having Officer Swisher in the schools not only provides safety and security, it has allowed the district to reinstate the DARE programs. This program teaches fifth grade students about the dangers of drugs, alcohol and other unhealthy lifestyle choices. Although primarily based at the high school, Officer Swisher is available to go to every building in the district as needed. Q: What is the best part about being an SRO? 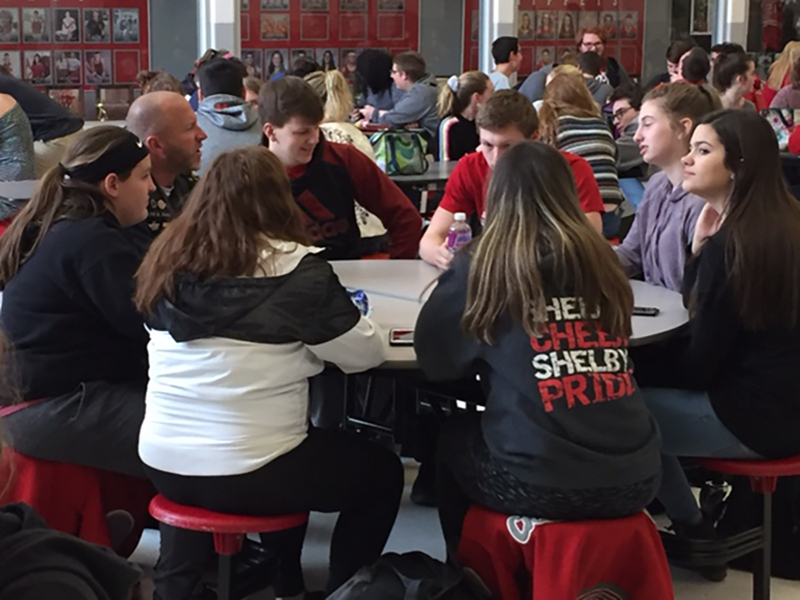 A: The best part so far has been the interaction and growing relationships with the students and staff throughout the district. Being called upon to assist in many situations as a Resource Officer is very rewarding itself. Q: What do you feel has been your biggest contribution this far? A: I feel the biggest contribution to the district so far is school safety and education programs. Whether it’s inside the buildings, parking lots, or travel routes to and from school, I feel that the students and staff feel safe due to officer presence. Q: What has been your biggest surprise? A: The biggest surprise so far is the decline in the number of violent and non violent criminal activity within the district. I can recall working Patrol and being detailed to the school for fights, threats, and many other calls each year in the district. A: The students and staff have welcomes me with fist bumps and high fives. Working together proves that anything is possible. I’m looking forward to the rest of the years to come.